What if we lived in a future where our robotic explorers could automatically detect and avoid hazards? What if they could do this while flying around an alien world, picking out a safe place to land without our intervention? That future is creeping closer for the next generation of robotic explorers. Autonomous Landing and Hazard Avoidance Technology (ALHAT) is a system under development to automatically detect and avoid hazards during landing. The system will be mounted on flight vehicles to analyze the terrain near a target landing location, creating a quick digital elevation model, and select a safe landing zone. 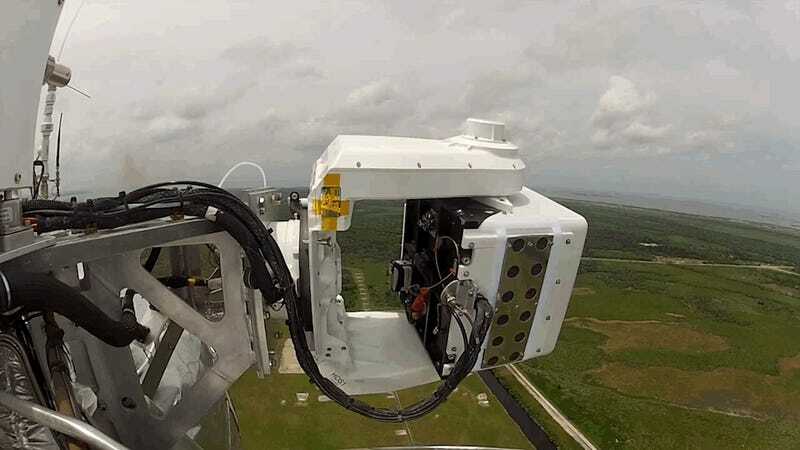 The 400 pound sensor package was mounted onto the 2,400 pound four-legged Morpheus prototype lander for a test flight last week. Although we already celebrated the successful test (go check it out! ), now we get a peek at what Morpheus saw with its fancy system. Morpheus used ALHAT to scan a 65-yard square with piles of rocky hazards, mapping out the zone to pick a safe place to land. After reaching the target region, the sensor has just 10 seconds to pick a landing site: 6 seconds to scan the ground, and 4 seconds to build a map. The map is made from a LiDAR flash scan — that means using a laser to quickly determine distances. The LiDAR points are constructed into a digital elevation model: an elevation map of the terrain. The last stage is processing the map to detect hazards, identifying areas of high or low hazard. Once the safest area is identified, the craft picks that as the landing point. The tests are all working out perfectly. These are visions of the future: load this system onto new robotic explorers, tell them where we want them to go, and watch as it figures out how to best accomplish exactly what we ask. Totally incredible.